Excellent Teamwork, Laura, Sales Analytics, and You! Log in to Sales Analytics from your mobile device. Get insights from your phone. 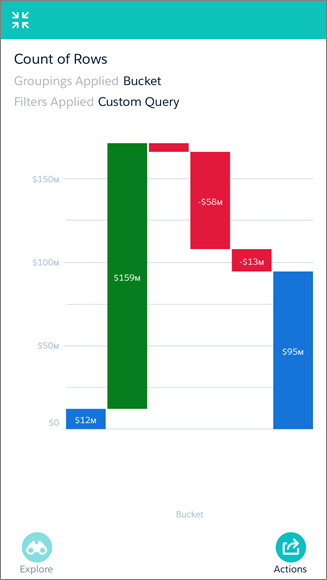 Understand trending and the waterfall chart. Thanks to Sales Analytics, Laura’s meeting with the CEO of DTC Electronics went great and the whole team enjoyed a delicious lunch. Most of the team’s back in the office, and you, Laura, and the CEO are lingering over an extra espresso. He tells you and Laura how impressed he is with the team and Sales Analytics. It’s given him some ideas and he wants to probe a little deeper. For one, he wants to come back to the pipeline since you went over that pretty fast during the meeting. Also, tablet sales have been key to the business for the past year, so he wants to see how your team’s been doing in that area. And he’s hoping to get details about a few members of the team so he can recognize them at the next company all-hands. Could he see more back at the office after you all finish coffee? "Why don't we look right now?" you say. You whip out your phone and open Sales Analytics on mobile! From either your iOS or Android device, you can log in to your org and access your Sales Analytics app. Sales Analytics supports both iOS and Android. The instructions here and in the rest of this module use the iOS version of the app, although Android users will have a very similar experience. Android users can download the app from Google Play. If you haven’t already worked with Analytics on mobile, follow the procedures in this and the next section to get up and running. Tap GET to install the app. Shortly afterward, the app appears on your home screen. Tap the Analytics icon to launch the app. Accept the License Agreement, and then take the walkthrough on the main concepts of Analytics. Installing Analytics on your iPhone makes it automatically available on your Apple Watch. Now connect to your new Developer Edition org to access Sales Analytics. Tap the icon in the upper left corner to open the account screen. Tap the disclosure triangle to the right of your account name. Then tap Add New Account. You’ll be redirected to the standard Salesforce login page. Enter your Developer Edition org credentials, and then submit them. For security, you might also have to enter a verification code that’s emailed to you. Tap Allow on the permission request page. Analytics opens to the home screen. Tap Analytics for Sales Managers to open your app. Great—you see all the dashboards you just saw on your desktop. With the app open on your phone, Laura and the CEO gather around to have a look. The CEO says “Wow, cool. 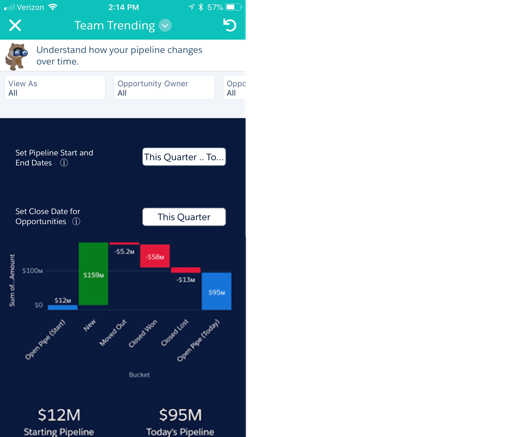 It would be great if we could see how much got added to the pipe this quarter—you know, what you moved in and out.” So let’s go back to the Team Trending dashboard, which shows the pipe, and get the details. With the app open on your phone, scroll until you find the Team Trending dashboard. You can also tap the search icon at upper right and enter trend to find it. Tap Team Trending to open the dashboard. Cool—a waterfall chart! This type of chart shows how the starting value increases and decreases by various factors over time, leading to the amount you have at the end of the time period. It’s great for visualizing trends in the amount of business you have in your pipe. Elements and data in your dashboard might be different than the images shown, although the steps we take you through still apply. If it's been awhile since you refreshed the data, you can run the Data Refresh tool in the Trailhead Data Manager now. To do that, go back to Salesforce on your desktop and select the Trailhead Data Manager in the app picker. Then click Refresh DTC Data. Once that’s done, come back here and refresh your app to see updated data. Swipe down and you can also see a list of opportunities for the quarter. Go back up to the waterfall chart. To get a better look at it, tap the chart and then tap the arrows (Expand) icon that appears below the chart. Laura and the CEO can now look at a full-screen view of the waterfall chart, and this picture really is worth a thousand words. It shows how the team has grown the pipe this quarter with new business. It also shows how business has flowed out of the pipe by being moved out of the quarter or closed. Tap the columns one at a time to see details about their contents. The chart makes it easy to see what’s gone into the pipe, and the CEO is pleased! Not much business has been moved out of the quarter, which has been a problem with other sales teams. And the team’s Closed Won number is much larger than Closed Lost. Now he asks for details about the Closed Won opportunities. Go back to the dashboard by tapping the arrows icon at the upper left to close the chart. Scroll down and you can also see a list of Closed Won opportunities. That reminds you and Laura that the CEO wanted details about a few team members’ performance. Where can you do that? Check out the Leaderboard dashboard! Close the Team Trending dashboard by tapping the X in the upper left corner. Tap the search icon , type “leader” and then tap Leaderboard to open the dashboard. Once it’s open, swipe down to the bar chart with a list of team members. Tap the chart so you can swipe through the entire list. Your answers: Yes, yes, and yes. Tap Closed Won just above the chart to open the list of options you can use to filter the members of your team. Remember, any time you want to return to the dashboard to its original state, click the revert icon at upper right. Select Avg Sales Cycle (days). The team member chart redraws to show you the average number of days each member of the team has taken to close deals this quarter. Swipe down to see who’s got the quickest average. Now tap Avg Sales Cycle (days) and select Pipe Generated to show the CEO the leaders in that category. The CEO loves it, and he wonders if he can get the info in a form to share at the all-hands. The answer? Another yes. Tap the arrows (Expand) icon at lower left. The click the actions icon at lower right. You’ll see the Save & Share screen. Tap Share Snapshot. Tap Email to open an email window. Then tap Done and you’ll see the chart image in an email window. From there, you could enter the CEO’s email address and send the team chart. For now, tap the Cancel button to close the email (since you’re like not going to send the chart to your actual CEO!). The CEO asks you to send him charts about each member of the team so he has everything he needs to recognize them during the all-hands. Awesome! You’ve used the mobile dashboards to review the pipe and get details about Laura’s team’s performance. All that’s left is to show the CEO how tablet sales are going, and then you and Laura can get back to work and he can catch his plane. The app provides a dashboard targeted to the sales operations team. One of them—Sales Performance—should have the info the CEO wants. Go the app home page on your phone and scroll through the list of dashboards. Find Sales Performance and tap it. 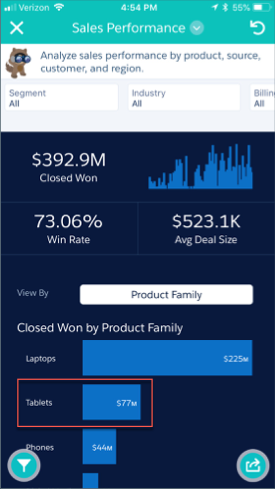 The dashboard shows your team’s performance selling all DTC products for the year, including closed won revenue, win rate, and average deal size. Looks great, right? Scroll down and you can see charts for products, Performance by Quarter, Top Opportunity Owners, and Win/Loss Analysis. All of them show results for all your products. How do you focus on tablets? The mobile app makes it easy. Tap the Tablets bar. (You may have to tap it twice to select it.) Now you can see just tablets—in all the charts! Drag up and down to see. To test that, tap the Tablets bar again, and all the charts redraw to show all DTC products. That’s faceting at work again! The CEO is excited, and even Laura’s surprised her team’s done so well. Since this looks so easy, the CEO wants to explore. “Let’s dig in to this dashboard a little more,” he says. You drag down to look at two other really useful charts: one showing your team’s top opportunity owners, another with a win-loss analysis. And faceting makes them even more useful. Tap the Top Opportunity Owners and tap a bar. 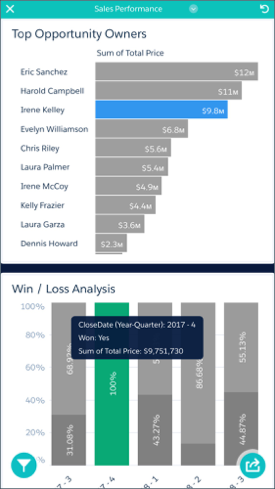 The Win/Loss Analysis chart redraws to show quarter-by-quarter results for the team member. Go to the Opportunity Details list at the bottom of the dashboard to see that the entire dashboard redrew to show results for that rep.
Now tap the Win/Loss Analysis chart and select a bar for one of the weeks. 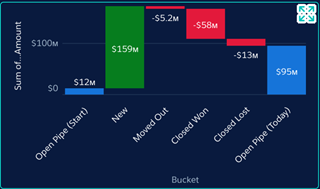 The Top Opportunity Owners chart redraws to show how opportunities for that member of your team stack up against everyone else. Pretty useful for tracking how each member of the team is doing with product sales, right? And if you want to know more, you can drill in further. 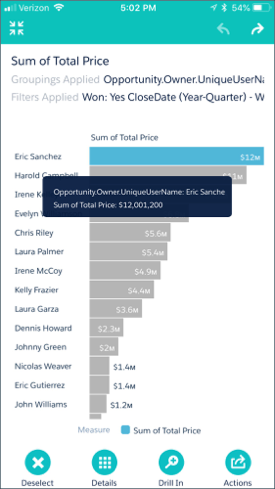 Select the Top Opportunity Owners chart and expand it by tapping the arrows icon . Select the bar for your top performer. You can now see the amount of business won by the rep.
Click Details at the bottom of the screen to see the rep’s opportunities. Tap Actions at bottom right to open the Actions menu for the rep.
As you can see, from there you can take action on an opportunity. Laura and the CEO see they can go right from insight to action from a single dashboard. All the more reason to think that Sales Analytics is pretty useful, right? Time to head back to the office, but what a great lunch. You proved the value of the app to your CEO right from your phone. And now that he’s interested, you’ll set him up as a Sales Analytics user this afternoon. Laura is happy, too, because the app helped her to show off her team’s good work. And she’s full of ideas for how to improve performance with Sales Analytics. Don’t forget that there are many ways to customize Sales Analytics. You can supplement datasets and add to dashboards to fine-tune what’s shown in the app. You can add your icon and other branding elements into the dashboards. As you and Laura show the app to others, you’ll get ideas for how to improve it. With the iterative app lifecycle, you can quickly and easily create the app over again as often as needed. Now you know how!